by Grice, George L.; Skinner, John F.; Mansson, Daniel H.
Mastering Public Speaking shows students both the hows and the whys of public speaking using an instructional approach that positions the instructor as a “guide on the side” rather than a “sage on the stage.” By challenging students to make the decisions required of public speakers, the text empowers them to take responsibility for their own learning. 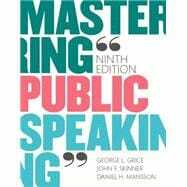 In its Ninth Edition, Mastering Public Speaking reflects the current twenty-first century realities that have altered our expectations of what a public speech can accomplish, including new media and emerging technologies. At the same time, the authors’ basic instructional approach remains focused on the key ingredients of effective speech, including sensitive audience analysis, adequate research, clear organization, and dynamic delivery. MyCommunicationLab for the Public Speaking course extends learning online, engaging students and improving results. Media resources with assignments bring concepts to life, and offer students opportunities to practice applying what they’ve learned. And MediaShare offers an easy, mobile way for students and instructors to interact and engage with speeches, visual aids, group projects, and other files. Please note: this version of MyCommunicationLab does not include an eText. Mastering Public Speaking, Ninth Edition is also available via REVEL ™, an immersive learning experience designed for the way today's students read, think, and learn.